Posted by Teresa Mihelic HelpDesk on Monday, December 10th, 2012 at 12:33pm. Many events are going on in our beautiful South Orange County area this weekend. For starters, don't forget this Friday and Saturday December 14th and 15th at the Dana Point Harbor, the beautiful Boat Parade of Lights continues. This is a gorgeous display of lights and Saturday will be the last day, make sure not to miss it! Dress warm, bring some hot drinks and enjoy! The Parade can be seen anywhere in the Harbor. 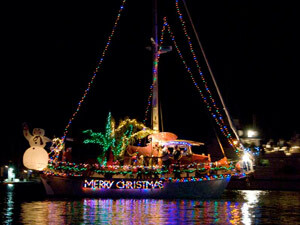 Parade of Lights Holiday Cruise with KSBR from the Ocean Institute: from 7:00pm to 9:00pm. The Ocean Institute will present a Parade of Lights Holiday Cruise with Jazz! FM 88.5 KSBR radio on Friday, December 14th at 7pm - 9pm. Participants can enjoy Christmas cheer and listen to Christmas music while participating in the 38th Annual Parade of Lights in Dana Point Harbor. Enjoy hors d'oeuvres, sweets, and hot beverages .Cost: $52.50 Adults; $42.50 children ages 4-12. For more information, call the Ocean Institute. Santa Paws: from 10:00 AM - 3:00 PM at the Dana Point Harbor - El Torito Courtyard. Pet Project Foundation is excited to host the 2nd Annual Santa Paws event. Bring down your favorite pet and have their picture taken with Santa for a small fee. All fees go to support the Pet Project Foundation. The Metrolink Holiday Toy Express: this is a really cute event for the kids to see. This 41 stop tour, which passes through six counties, brings a brightly packaged gift to Metrolink communities – a 450-ton train decorated with holiday displays and 50,000 twinkling lights – and delivers a live musical performance, Santa and community fun. Join us, ABC7 and Southland Firefighters who will be collecting toys at the station stops as a key part of their overall annual “Spark of Love Toy Drive” in the region. Laguna Niguel/Mission Viejo 5:45 P.M.
San Juan Capistrano 6:45 P.M.
And if youu can't attend any of these, there's also the Christmas Train at the Irvine Park. The Railroad’s annual holiday train brings lots of Christmas fun in each ride. Cost $10 per person. For more info visit: www.irvineparkrailroad.com.